The ongoing refugee crisis has caused unimaginable hardship and suffering for children and young adults who have been forced to flee their homes. Throughout their journey towards safer lands, many young refugees have confronted violence, hunger, and the numbing reality that the places that they once called home have been left behind. The proportion of minors among the refugees entering Europe is significant. In Germany, for example, about a third of the individuals who are currently seeking asylum are under the age of 18. In addition to shelter, food and health care, children and youth need educational opportunities, supportive relationships, meaningful social interaction, and opportunities to play with one another so as to ensure their healthy physical and mental development. 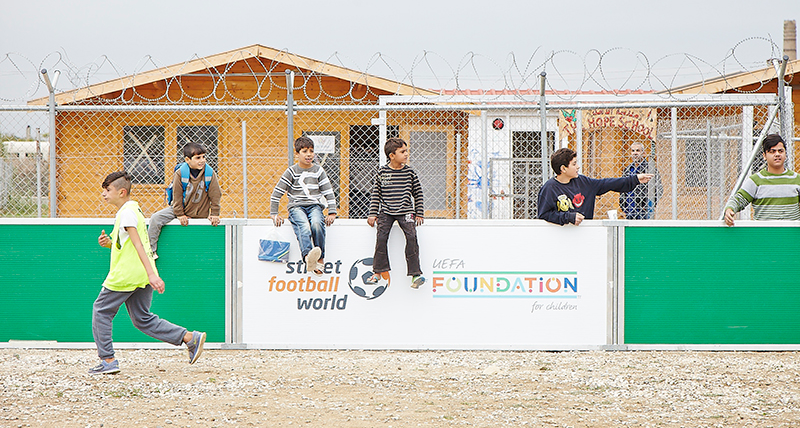 To address these challenges, the UEFA Foundation for Children and streetfootballworld have created the Refugee Support Programme. This programme welcomes football for good organisations to apply to streetfootballworld for ‘Programme Support’ in the form of funding provided by the UEFA Foundation for Children. These applications include descriptions of new or already existing football-based community development projects that seek to foster social cohesion among communities in Europe that have been affected by the refugee crisis. Projects should also primarily target participants of 18 years or younger. After gathering the submitted applications, streetfootballworld will then evaluate the project proposals and subsequently recommend the allocation of UEFA funds to projects that promise the greatest impact in the field of social cohesion. On average, funding ranges from 15,000 and 90,000 EUR per organisation/project per year. The UEFA Foundation for Children is currently supporting 23 football-based refugee projects across Europe with 1,000,000 EUR in funding. The support programme was launched in March 2016 with streetfootballworld’s call for project proposals regarding social cohesion. The funding scheme aims to reach up to 32,000 participants across 15 countries (Belgium, Bosnia & Herzegovina, France, Georgia, Germany, Greece, Hungary, Ireland, Italy, Serbia, Romania, The Netherlands, UK, Ukraine). In addition to providing financial support to football-based development organisations, streetfootballworld and the UEFA Foundation for Children have launched additional initiatives aimed at complimenting the efforts of organisations to facilitate social cohesion in the host societies. As the use of the football3 method has gained momentum in the field of fostering social cohesion, streetfootballworld is currently deploying football3 ‘train the trainer’ workshops in communities that have been affected by the refugee crisis. The central lessons of football3, including communication, respect for your fellow players and peaceful conflict resolution, all speak to daily challenges facing refugees and their host communities in this time of transition. In the second half ot 2016, streetfootballworld has distributed the remaining official gear of Euro Cup 2016, which consists of almost 11,000 pieces of clothing and equipment, to 30 football for good organisationa across Europe. Organisations have received material such as bibs, footballs, training shorts, jackets, and t-shirts to use within their development projects.